It is a truth universally acknowledged that a board game in possession of a large fan base must be in want of a spin-off. Or an expansion. Or something else that allows the company that produced said popular game to capitalize on its good fortune. Such is the case with Ticket to Ride, a game that @Futurewolfie and I uncharacteristically agreed upon and raved about here. But spin-offs and expansions can be of variable quality. For every Prosperity, there’s a Catapult. So where does Ticket to Ride: Europe (a standalone game) fall on the spectrum? Find out below! Ticket to Ride: Europe is a standalone game (meaning everything you need to play is included in the box) and works much the same as regular Ticket to Ride (full explanation here): the goal is to get the most points by connecting cities on your destination tickets and by having the longest continuous segment of tracks. 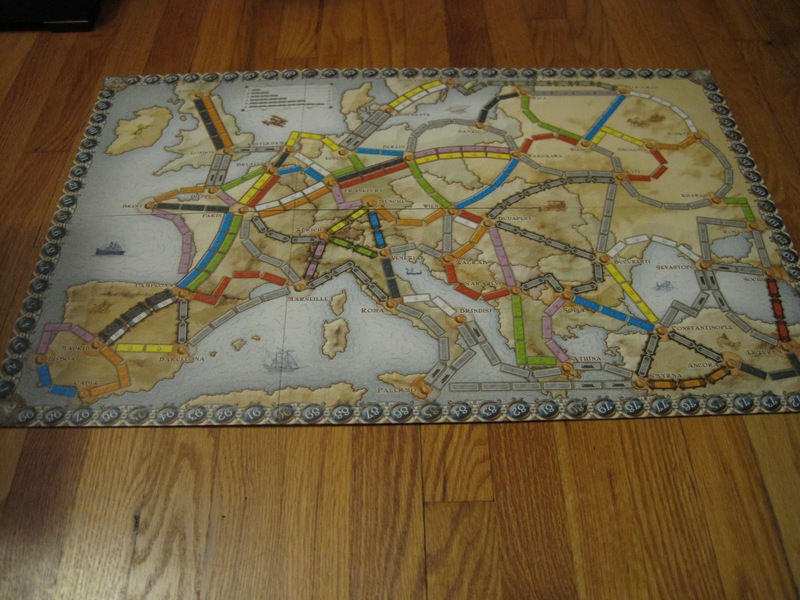 You do this by playing sets of colored train cars to claim corresponding tracks on the board. This part is all very familiar. But Europe has its own twists. First twist: you’re not in Kansas anymore. Ticket to Ride: Europe features exotic destinations from London and Paris to Pamplona and Madrid to Rome and Athens to Moscow and Petrograd. The western side of the map is more cluttered with shorter tracks between cities, and these tracks are snapped up quickly. Second twist: there are certain special tracks on the map, namely tunnels and ferries. Because you can’t always see your way to the end of the tunnel when you enter it, tunnel tracks can be of varying lengths. 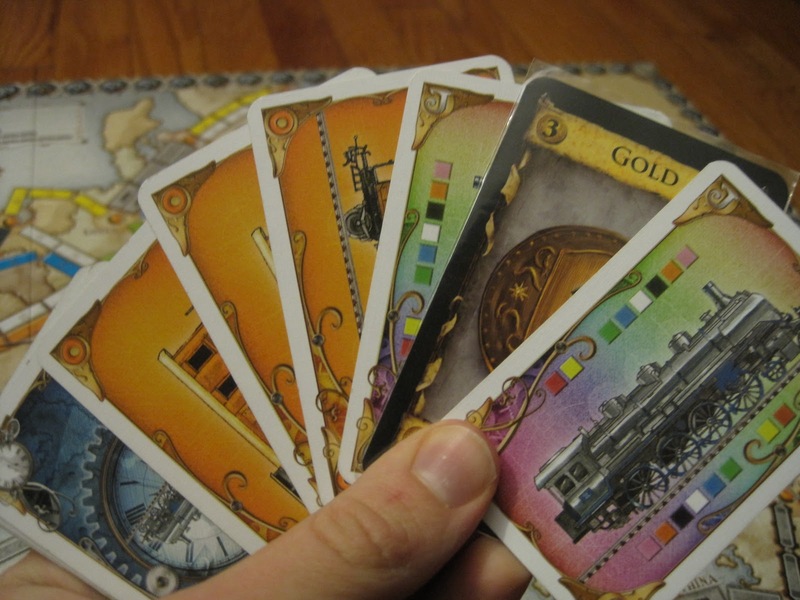 In order to claim a tunnel, players must first reveal the color of train cards they wish to use to claim the track, then three cards are revealed from the top of the deck. If any of these cards match the color, the claiming player must use additional cards to claim the track. There are also ferry tracks (which, as you might guess, go across water). To claim these tracks, players must have a number of locomotive cards to combine with their set of cards. Fourth twist: routes are divided into long and short routes, so each player should generally have the same opportunity to claim big points at the start of the game. Long routes are only given at the beginning of the game. All other rules of Ticket to Ride remain the same. Ticket to Ride: Europe is the Ticket to Ride game I am most familiar with. Yes, it’s derivative from Ticket to Ride, but it doesn’t claim to be anything else. And you know what? I like it even better than its predecessor. Yellow, cut off at the pass, must either detour or submit to placing a station in Berlin. Wise choice, yellow. The second thing I love about the Europe version is the new track types, specifically the tunnels. Yes, they are a little gimmicky, but they make the game more fun, and they force players to make another interesting decision: do they go for the tunnel as soon as they have the base amount, or should they stockpile cards until they have enough to claim the track at its maximum size? It may not seem like a big deal, but you can waste your whole turn if you don’t have enough cards to claim a tunnel. Similarly, you can derail (!) a later turn if you are too cautious. In my household, whenever we reveal the tunnel cards, we do it dramatically in slow motion, which greatly improves the experience. There are some quirks about the Europe map that may turn off some players. First, each city is written on the board as its known in the country of origin. This can be confusing for a gringo like me (though I love the flavor this adds). Similarly, having attended public school, my European geography is not what it should be, so there is more of my checking where cities are than in the U.S. version. Second, I’ve heard criticisms that the Europe map is easier than the U.S. map (presumably because of stations and more ways to get around). This may be true, but I haven’t noticed much difference between the two maps except in a way that makes Europe a bit harder: Europe has a cluster of very important cities very close together, which can make the beginning of the game a mad dash. This is especially true if you play with the Big Cities variant in the Europa 1912 expansion (yes, the spin-off game has its own expansion…and yes, I bought it almost right away…). 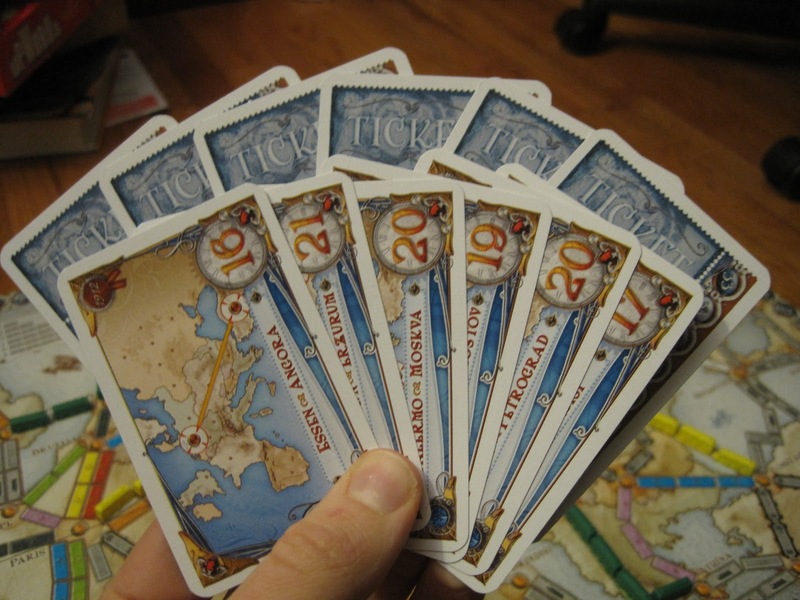 In Big Cities, each destination ticket features one of eight Big Cities, so the game revolves around building a good rail network and earning the most tickets for the least amount of work. I, personally, love this aspect of the map, but it’s a turn-off to others. So be it. I’ve included a Dominion card, not because I’ve forgotten which game I’m reviewing, but to show you that the train cards in TTR: Europe are just a bit shy of the standard Euro size. They’ve also got a linen finish. Nice! Just like Ticket to Ride, the components in Europe are top-notch, maybe even topper-notch, as the train cards are normal size, not tiny. This brings us to the elephantine question in the room: should you get Europe if you already own Ticket to Ride? My answer is probably not, unless you really want to play the game in Europe. In which case, convince one of your friends to buy it, or just go to Europe. 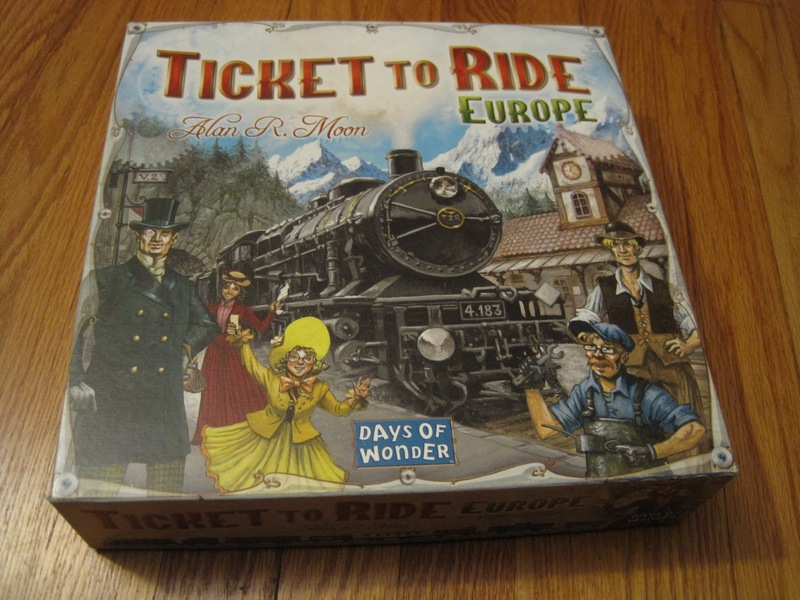 (One can dream…) While Europe is a great game (and in my opinion, even better than the original Ticket to Ride), there’s probably not enough new here to justify another purchase. But if you don’t yet have Ticket to Ride yet—first off, I’m so sorry; second, why not get the Europe version? 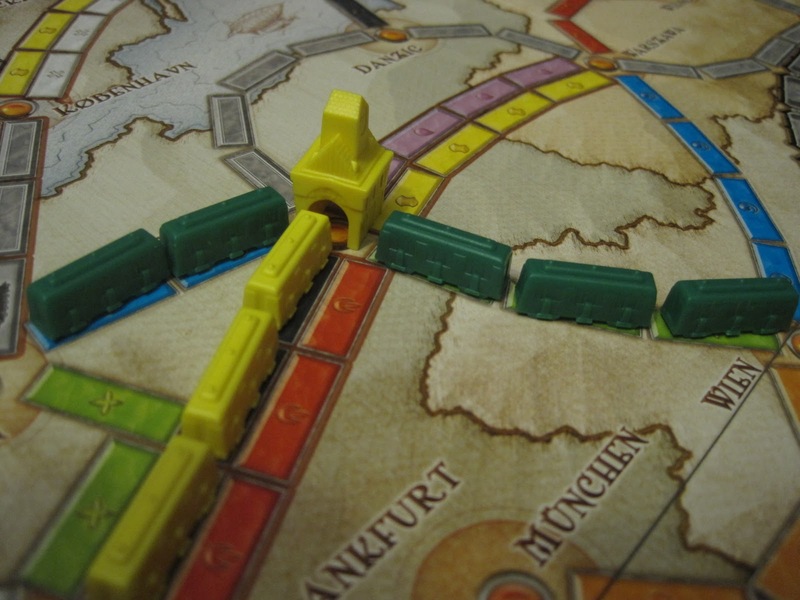 At its heart, Ticket to Ride: Europe maintains the tight finish and simple mechanics of the original TTR, with a few twists that make the game SLIGHTLY more complicated. It’s more than just a different map; although you’d be surprised how different the various TTR maps can play. The rule variants require a bit of different thought, but these are not just “variants” – the new rules really are necessary to make the Europe map work. The truth is, the Europe map is a lot “smaller.” Not in the sense of physical size, but cities tend to be closer together with smaller trains between them. The “Tunnels” variant artificially extends the length of certain key routes – you could always risk going ahead with the base amount, but the chances of losing a whole turn strongly encourage players to collect at least one, preferably two extra cards before claiming around. This essentially turns a “4” length connection into a “6” length connection without taking extra space on the cramped board. The Stations too are necessary, since the board is a little more cramped. You’re a lot more likely to overlap with other players on this map, which can be a frustrating endeavor. But since you can place a station to help you make that last, stolen connection, the map opens up a little, allowing room for all players to breath. The “long routes” addition is perhaps the least necessary, but a welcome addition. Few things are more frustrating in the original TTR than drawing destination tickets worth 4, 5, and 6 while your opponent draws a 21, 10, and 7. Sure, those routes are easier to complete, but more than likely the opponent can complete more than one of his cards with a few offshoots to his longest route, or maybe even a minor detour, scoring triple the points for the same amount of effort. Long Routes at least offer big points to each player at the start, which evens up the playing field. The long routes. What a haul! Stations, tunnels, and ferries also serve to make Wild Cards all that more valuable. I actually learned TTR: Europe before TTR, and when I switched to the North American continent, I was surprised at how little motivation there was to spend a whole turn for a single wild card. In Europe, wild cards are required for ferries; they’re required for stations; and they’re extremely useful for tunnels. Just think – if you have 3 wild cards in your hand, you can always go for tunnels with the base number of required cards. The likelihood of requiring 3 extra trains is small, and any wild cards you don’t use to complete the tunnel, you have for future tunnels regardless of color – rather than being stuck with a now-useless color. That makes the draw of taking that one face-up wildcard so much more, whereas in regular TTR you generally just hope to get wild cards when you draw blindly from the deck. Like @Farmerlenny said, though, if you already have TTR, this doesn’t really add a ton more worth justifying a full-game purchase. But TTR: Europe makes a solid showing, so if you’re looking for your first TTR game, this is definitely a viable option. On the one hand, it would have been nice if this was a $20 expansion; on the other hand, it’s nifty that you can get this game and play it without having to shell out for the US version. You’ll just have to decide for yourself. Want another opinion? Check out The Board Game Family’s Ticket to Ride: Europe review. Improves a near perfect game! It's a standalone expansion, but it's difficult to justify the cost of an entire new game if you already own the original. I love this game. Great review. Thanks! I love this game as well.